Sure, Amazon has great prices. And they probably have a larger book selection than your book vendor, too. But there are other much more important ways your book vendor has Amazon beat. I only have access to Ingram, so I will include screenshots from there, but other major book vendors also have similar features, so look for them and/or ask your vendor representative. Check to see if your book vendor offers full text reviews. Many of them do, though it might cost a little for this upgrade. Do it -- it's worth the money! Whenever you are looking up a book, it's so convenient to be able to scroll down and read all of the reviews, in full text, right there from such journals as SLJ, Kirkus Reviews, Horn Book Magazine, Booklist, Publishers Weekly, VOYA, BookPage, and Bulletin of the Center for Children's Books. Book vendors like Ingram offer review alerts. This feature allows you to select journals and age groups from which you want reviews. You can be notified of all reviews, just 5 star reviews, or any combination thereof. They put the books in cart for you to browse through. You can delete what you don't want and order the rest. In Ingram, they create a new cart every two weeks. When I weed nonfiction, I now scan the ISBN of my weeded book and search via the Dewey number or LC call number (They are clickable links). It immediately brings me to the latest books in that subject area. You can limit the search by audience so you can then only see the books for your particular age-group. Big time saver! And, since you upgraded to the full-text reviews, you can read the reviews on these books right away. 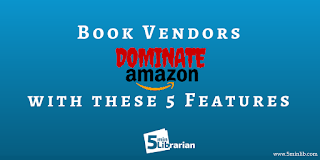 Don't forget the browsing features in your book vendor's program. Ingram has categories where you can search by character traits, locations, ethnic orientations, and more. Determine where your collection is weak and then browse those categories to beef up those sections. Bonus: This could also be really helpful when planning special displays, if you are familiar with what you have in your collection. Check to see if your book vendor makes special carts, especially for award winners. Sure, it is simple enough for you to look up each individual title, but you'll save a lot of time just browsing a premade cart. Give your nine fingers to break, and just use one to click next. It seems obvious, but I didn't know this when I first started and I still meet people who weren't taught this in graduate school. Many book vendors offer automatic ordering. (For some reason, I had assumed this was only an option for the "big" libraries. Nope, anyone can do this). You can select your patrons' favorite authors or series (especially manga/graphic novels), and (for Ingram at least) every two weeks, the vendor will create a cart of them. You can view the cart, delete anything, and after the deadline, it sends the cart off as an auto order. If you are keeping a close eye on your budget, you'll be happy to know that you can change the auto order option to be "just a report" whenever you want. If you prefer just to receive a report every two weeks, that is fine, too. You can manually order the report or move those titles into other book carts. Have any additional tricks with how to get the most out of a book vendor? Please share below! Does Your Library Transform Lives?